In most radiology practices, the knee is the most commonly imaged joint in the appendicular skeleton. There is wide variation in the field strengths of clinical magnets (ranging from 0.2 to 3 tesla [T]), the configuration of the magnets (open or closed), the sequences (e.g., T1, T2, proton density, conventional spin echo, fast spin echo, gradient echo), and slice thicknesses used to image the knee, as well as a wide variety in the skill of the radiologist interpreting the images. All of these factors have bearing on the accuracy of the magnetic resonance (MR) examination as well as the anecdotal usefulness of this modality to the referring physician. 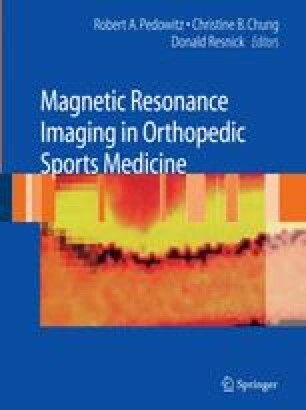 Nonetheless, Glynn et al., using Medicare data on reimbursements between 1993 and 1999, found a 145% increase in performance of magnetic resonance imaging (MRI) of the lower extremity and a 54.5% decrease in performance of diagnostic arthroscopy of the knee, suggesting an increasingly greater reliance by clinicians on MRI to provide diagnostic information. Similarly, Bryan et al. found that the use of MRI in the diagnostic evaluation of patients with chronic knee complaints significantly reduced the need for surgery.